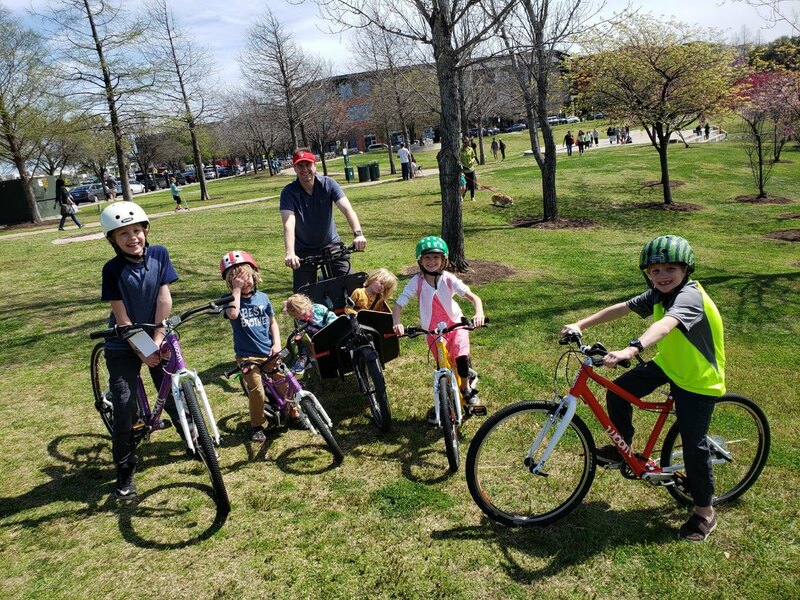 Our Family Bike Tour departs from our solar-powered location - our red Launchpad - conveniently located in the heart of Austin's family-friendly Mueller neighborhood, just across from Alamo Drafthouse and a short block away from Thinkery. We have bikes for everyone to enjoy! Adults will relax and feel superhuman riding our electric bikes - or - can choose to ride one of our electric cargo bikes to give your child/children the thrill of riding in a European-style "bucket bike"! Kids 18 months-17 will enjoy use of our woom bikes (non-electric, but super lightweight kid's bikes, sized by age & capability). We provide helmets but you are welcome to BYOH if you would like. Perfect for birthday rides, great report card celebrations, anniversaries, engagement parties, or any other reason to be around those you care about. Our Family Tour is Private - meaning your group will be the only focus of your guide(s) and you will not be touring with guests other than your group. Rocket eBike Tours for Groups - An Austin Favorite! The tour that started it all! #1 Outdoor Activity in Austin on TripAdvisor for 7 years! It might sound silly, but yes, adults need to know how to ride an ebike (with confidence) to be on one of our bike tours. Pretty Please: If you know of riders in your group that are 5 foot 4 or under, PLEASE note your need for a smaller ebike within the Notes field on the reservation form. We're not trying to be meanies, but you MUST contact the shop within 48 Hours BEFORE the scheduled day of your ride to cancel and receive a full refund. If you don't call or write and decide to cancel your rental/tour less than 48 hours before your rental/tour, we will not issue a refund. If you do not pick up your overnight rental prior to 4pm, we'll assume that you aren't coming and will release your ebike reservation to someone else - and sorry, we're not going to refund you. We know Austin is fun, but don't stay out so late that you sleep through your reservation. Our guides are always ready to ride, but if the forecast reflects a strong likelihood for thunderstorms, sleet, hail, zombies, snow, dust storms, hurricanes, or if it is below 45 degrees (F) or above 120(F) on the day of your scheduled ride, it will be up to us to cancel the tour and keep you safe - we will "rain check" your reservation to another day (subject to availability) OR provide you a full refund. For your safety, the group’s safety, and the safety of our equipment, all participants MUST be able to confidently ride a bike. If a guest is not riding confidently enough to travel safely on Austin trails and streets, Rocket Electrics will prohibit that guest from riding and will not issue a refund.